A friend recently confronted me about my claim that Calvinism is one of the most damnable doctrines of these end times. Because he is a leader in a church that has been distracted by this destructive teaching, the subject is a sore spot for him and he takes my challenges very personally. I assured him that my only goals were to submit fully to Scripture, teach only what the Bible teaches, and rescue the lost from the clutches of the ever popular "Do it MY way entitlement religions." During our lengthy discussion, the man referenced very few passages of Scripture. The ones to which he did refer weren't quoted and rarely were even given locations. In order to substantiate his claim to a superior appreciation of grace, he repeatedly referenced the positive things his church was doing. He spoke of the atmosphere, the outreach, the family values, etc. I congratulated my friend on these positive accomplishments, then I returned the conversation to the original topic by asking him a series of very divisive questions, "But does your church insist on obedience to all the commands of Scripture? Does your church teach that Peter's words during the very first Gospel sermon are worthy of submission, Acts 2:38? Does your church teach that baptism is necessary FOR THE REMISSION OF SINS or do you use it as an initiation rite or an outward sign that sins have previously been remitted? Awkward silence filled the air. I felt sorry for the man. He was clearly under conviction. I wanted to say something that would end his misery, however, I knew that to do so was to interfere with the working of the Holy Spirit. I waited. Slowly his eyes met mine. "No, we don't teach that baptism is necessary for the remission of sins," he confessed with a tone of regret. For a brief moment I had great respect for my friend's willingness to process and submit to scriptural authority. For a brief moment I was hopeful, I was prayerful that he would actually embrace the leading of the Holy Spirt. Then it happened. Just one word. A very small word. Yet, even though this tiny word is only comprised of three letters, it often introduces a giant excuse which almost always marks a Hellish victory for Satan's cause. The man's eyes glazed over. Defiance refilled his heart and he said it. 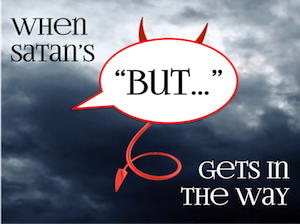 Satan has a very big "But…" and I am so very weary of watching it get in the way of God's will! Matthew 7:22-23 (NKJV)"Many will say to Me in that day, ‘Lord, Lord, have we not prophesied in Your name, cast out demons in Your name, and done many wonders in Your name? ’ And then I will declare to them, ‘I never knew you; depart from Me, you who practice lawlessness.'" When will we ever learn to be fully submissive to the will of God?! When will we look beyond Satan's "But…" and realize that no church activity, congregational statistic, or religious accomplishment is great enough to trump the authority of the Lord's holy command! Do you know why Jesus will say "depart from me" even though they have prophesied, cast out demons, and done many other great works in His name? Read the previous verse. Matthew 7:21 (NKJV)“Not everyone who says to Me, ‘Lord, Lord,’ shall enter the kingdom of heaven, but he who does the will of My Father in heaven." What about you? Does your church submit fully to the full plan of salvation? Have you been baptized FOR THE REMISSION OF SINS? "My brothers and sisters... are baptized out of faithful obedience.... How is that different than what scripture teaches and what you teach?" I recently received the following inquiry from a good friend who presents a typical, yet very important question. Q: "My brothers and sisters at my church are baptized out of faithful obedience and the churches I have visited do the same. How is that different than what scripture teaches and what you teach?" A: "Not sure. Is their 'faithful obedience' to the biblical purpose of baptism? Acts 2:38 says that Peter baptized 'for the remission of sins'. In other words, on the very day that the Holy Spirit descended upon them with Divine inspiration, the message from Heaven said baptism is essential to save, it IS the very point at which sin is remitted. Most churches baptize either to initiate a person into that particular church or as an outward sign that they were saved before being baptized. Neither of these reasons are biblical. If your congregation baptizes for the express purpose of taking away sin, then I think they have 'faithful obedience' to God's plan rather than man's. If not, their 'faithful obedience' is to their own desires, not to God's command." Know this, when Satan's "But…" gets in the way, you can be fully assured that ravenous wolves have gone to feeding. The only way to survive their attack is to drop the "But…", hit the knees, and call out toward Heaven, "Not my will, but Thine be done!" Please shield me from the compromise. Back to Top of "When Satan's 'But...' Gets in the Way"